The first few kilometers out of town were a disappointing road walk, but then the trail went off onto a dirt road and things were wonderful again. No vehicles driving past, no hard asphalt to walk on, and still separated from the main path post people followed. For the entire day, I saw only about half a dozen pilgrims along the route, and two of them were Nancy and Tom who I shared a room with overnight. This section, my guidebook tells me, is classified as "the most perfect extant stretch of Roman road left in Spain today" and that "we follow in the footsteps of Emperor Augustus himself but he will have travelled with a retinue of servants not available to a humble pilgrim." There were a couple of confusing, poorly-marked turns that had Andrew, the German girl, and myself scratching our heads a bit, but we muddled through without any wrong turns. My biggest fear wasn’t getting lost—it was accidentally walking into Reliegos and wound up on the crowded road walk. No, I wanted to stay on the remote alternative path all the way into Mansilla de las Mullas, even if it did pass a giant prison. But all-in-all, it was an uneventful day of hiking. I checked into the municipal alburgue. I was tempted to look for a place to camp, but the map ahead didn’t look promising for good places to camp. A lot of road walking along a busy highway, and a chance of rain was definitely in the forecast. In the alburgue, I shared a room with a young couple from Vancouver, Canada, and when I introduced myself, the girl asked if I was the “Ryan from Seattle” she had heard about. She seemed quite excited to meet me, even though I had absolutely no idea who she was. Wow, word really gets around. =) And then I realized I’d probably get getting this message over and over again until I finished my hike, whether or not I ever found Karolina. There aren’t any off switches for these kinds of messages. But Karolina would stay MIA. At least for today…. Another hiker loses a boot. You see a lot of lost boots on the trail…..
One pilgrim who died on the trail they buried here. A lot of people call this scenery boring, but I beg to differ. It’s beautiful in its own, stark way! So much flatness! thick throughout the day and a chance of rain was in the forecast. pilgrim on the truck’s hood, though…. I’m not sure what this plant was for. Sand to turn into concrete? though, whatever it was for. A statue of a pilgrim in Mansilla de las Mullas. More camino art in Mansilla de las Mullas. 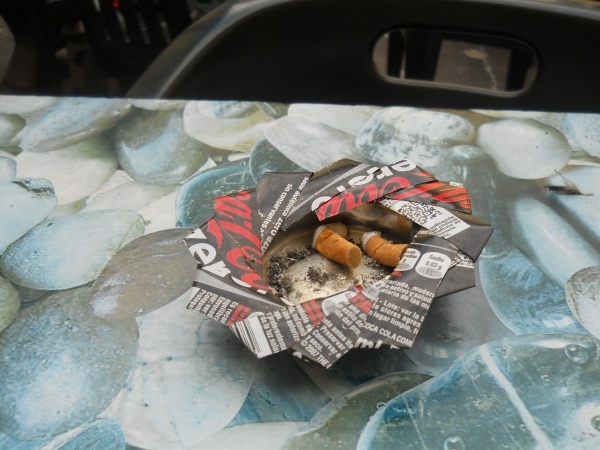 I'm not a smoker, but I was fascinated by these ashtrays made out of soda cans. "At least for today…." The plot thickens. judging by the stark landscape I would almost say you were hiking in Oklahoma... but the other sites are definitely not in Oklahoma. Perhaps there is a way to turn the stove into an ashtry and get a "2for1" deal!